Yesterday's release of Mailbox for Android was not the only announcement that Dropbox made on that day. The company revealed another app on the same day, and it too was released as a free standalone application for the Android operating system. 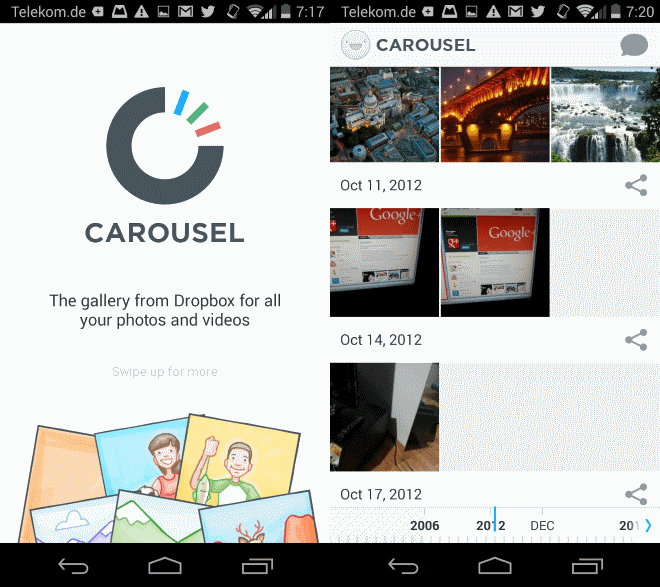 Carousel is a new app by Mailbox creator Gentry Underwood which has been released for Android and iOS yesterday. It allows you to browse your media collection that is hosted on Dropbox in a new comfortable way, to manage all these photos, and to share some or all of them effortlessly. The review uses the Android version exclusively but from what I can tell, works identical on iOS. Once you have installed Carousel on your device, you are required to connect it to your Dropbox account. If the account is already set up on Android, Carousel offers to automatically connected to it. You can however select a different account as well if you prefer that. The main screen displays all photos and videos sorted by date and a time bar at the bottom of the screen. You can navigate either by swiping up or down to scroll between dates, or use the time bar at the bottom for larger jumps. The process is fluent and there is virtually no delay when you are using either feature to browse your media collection. One of the core features of Carousel is the apps' sharing feature. You can long tap on a photo or video to add it to the sharing queue or tap on the share button displayed next to a date to add multiple media files to it immediately. You can then go through your collection to add other photos or videos before you click on the share link to use Android's sharing options to share them to friends, contacts, or services. A single tap on a photo displays a larger version of it on the device. You can pinch zoom here, or scroll up to add it to the sharing queue, or down to hide the photo from your gallery. A swipe to the left or right on the other hand loads the previous or next photo in the queue. Shared photos are always shared as links pointing to the Carousel website. When you follow that link, you see information about the person who shared the data with you, how many photos were shared, when they were shared, and a download button. Individual photos are downloaded in their native format, while picture collections as zip files instead. Carousel supports private conversations as well, which become available as soon as you start sharing with friends. The app displays all Dropbox photos in its interface with no option to have it display only local photos or only camera upload photos. While you can hide photos, it has to be done individually for each photo which can be quite bothersome depending on the number of photos that you want hidden. There are also no options to group photos in a different way. You cannot create albums for example or create custom picture groups using pictures taken on different days. Last but not least, there is also no option to name pictures or groups. Carousel uses location-based information exclusively to name them, and there is no option to add custom names. Dropbox has a media viewer which may be sufficient if all you want to do is view photos or videos using the Dropbox app or share it. What Carousel adds to the table is better management of all photos stored on Dropbox. If you take lots of photos and videos using your phone, then you will benefit the most from the features that Carousel offers, especially if you share photos regularly with friends.